Christianity is nearing crisis point in these end times. We are living in momentous days. There is an URGENT need for a GOSPEL REVOLUTION, a return to what Jesus and His apostles would consider genuine Christianity to be. Our faith is shaped and defined by THE GOSPEL, what we believe. 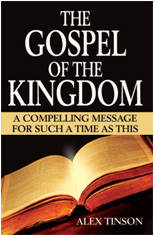 The purpose of this ministry is to preach and teach the true authentic gospel, and to speak forth what the Spirit is saying in these last days.